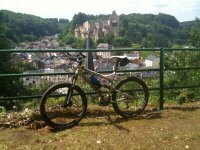 A sportive stay in in Larochette: one day mountainbike- or biketour, one day canoeing and a day with culture, where a LuxembourgCard gives you entrance to 80 museums, castles and attractions and free public transport. One evening of your choice, you'll enjoy a 3-course dinner in our restaurant. When booking 50 % of the total amount will be charged as deposit, we ask you to pay the remaining 50 % 10 days before arrival. If your booking is made within these 10 days, deposit is 100%.